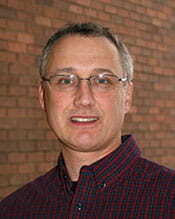 University of Wisconsin-Green Bay Prof. Kevin Fermanich, Natural and Applied Sciences, has been named to the Barbara Hauxhurst Cofrin Professorship of Natural Sciences, effective July 1, 2014. He is appointed for a five-year term. The professorship recognizes and gives support for a full professor who has demonstrated a productive commitment to scholarship and/or outreach, and whose work exemplifies the spirit and mission of UW-Green Bay. It was established by longtime UW-Green Bay supporters Dr. David A. and Mary Ann Cofrin in memory of his sister-in-law, a devoted mother of six, an active participant in her community and an accomplished sportswoman. Fermanich is past chair of UW-Green Bay’s Environmental Science and Policy Graduate Program, and has taught courses including Introduction to Earth Science, Hydrogeology, The Soil Environment, Environmental Systems, Remote Sensing and GIS and the Graduate Seminar in Environmental Science and Policy, among others. His research interests include soil processes and ground water quality; hydrology of wetlands and the fate of contaminants. Fermanich was instrumental in starting UW-Green Bay’s Environmental Management and Business Institute (EMBI), and served as its interim co-director during the 2008-09 academic year. He is the project director of the Lower Fox River Watershed Monitoring Program, a collaborative watershed education and stream-monitoring program that provides hands-on experience for teams of high school students and teachers from throughout Northeastern Wisconsin. He has taught travel courses in Costa Rica and supervised numerous research activities and graduate projects during his time at UW-Green Bay. Fermanich began his UW-Green Bay career as an assistant professor in fall 1998, receiving a promotion to associate professor in 2004 and promotion to full professor in 2013. He earned his Bachelor of Science degree from UW-Stevens Point, and his Master’s of Science and Ph.D. at UW-Madison. This entry was posted in Faculty/Staff, News, News Releases and tagged achievements, Barbara Hauxhurst Cofrin Professorship, faculty, Liberal Arts and Sciences, Natural and Applied Sciences, professorships on July 15, 2014 by Kelly Moore.